Welcome to the eighty-fourth of my blog interviews with novelists, poets, directors, bloggers, autobiographers and more. Today’s is with mystery, romance and paranormal author Michele Drier. If you like what you read, please do go and investigate the author further. A list of interviewees (blogged and scheduled) can be found here. Morgen: Hello Michele. Please tell us something about yourself and how you came to be a writer. Michele: I had little interest in writing until college. I entered college as a chemistry major, but had friends in the Journalism program, so I hung around them. They had better parties and better senses of humor than the scientists. Michele: I ended up as a reporter as a large California daily newspaper (the San Jose Mercury-News), got out of the business to go back to college. I entered a writing contest, Phelan Awards for Young California Writers, and didn’t win. Anne Rice won that year for “Interview with the Vampire” so I was way outclassed. Michele: I put everything in a box and spent the next number of years working in non-profit management and raising my daughter. About five years ago, I finally decided if I was going to write a book, I needed to start. I went to work part-time and finished my first novel, a mystery called “Edited for Death”. It’s being published October 1 by a small press in New England. I’ve independently published my second book, a vampire romance, in ebook formats. Morgen: That’s what I plan to do, although not vampire romance. 🙂 Is there a genre that you generally write? Michele: I began seriously writing (as opposed to writing chapters and sticking them in a file drawer) in the traditional mystery genre. The protagonist is a newspaper editor, so it’s not crime fiction, but she’s used to dealing with crime and law enforcement through her job; it’s not a cozy. I was pushed into the vampire, romance, paranormal genre by my daughter and son-in-law who read these by the bushel basket. Specifically, my daughter made an off-hand comment that all Hollywood celebrities could be vampires. They only come out at night, wear over-sized dark glasses, ride around in limos with tinted windows; it was too good to pass up! 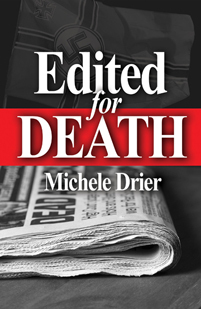 Michele: The first book contract I received was in February of this year for “Edited for Death”, the first of a series of newspaper-themed mysteries. I hope I can get the series finished before the complete demise of newspapers! Morgen: Yes, we’ve just lost the News of the World although (I’m hoping) that was an extreme circumstance. It does sound an interesting premise. Michele: That book is being published by Mainly Murder Press in Connecticut and will be available in paperback on October 1. It will be in ebook formats sometime in November. I published my next book, a vampire romance called “SNAP: The World Unfolds,” this July. It’s a quick, light summer read, but at the rates sales are going, it may be a read for next summer! At this point it’s only available in ebook format, although I’m looking into a print version. It’s also the first in a series, about the celebrity multimedia empire called SNAP. Morgen: That’s the good thing about eBooks they can just sit there – there’s no posting, reordering etc. but I think it’s all about marketing. How much do you do for your published works or indeed for yourself as a ‘brand’? Michele: Oh, that’s my current bane. I’m doing all the marketing. I’ve managed to put together a website, use Twitter and Facebook (although I’ve had a page for several years to keep up with family), I write and send out press releases, I’m working with my local library to put together some programs, I do an email blast every so often to my own list, I belong to Sisters in Crime and one of their subgroups, the Guppies (Great Unpublished). Michele: I’m getting blatant about asking to be on blogger and review sites, I’m trying to figure out how to use all my media contacts (you need to have a hook beyond just publishing a book!). Michele: I’m going to approach local broadcast media and pitch the idea of talking about how you can write and publish your own book, and, and, and…. I’ve never been very good at self-promotion, it goes back to my Victorian grandmother who said a lady never talks about herself. Morgen: I was going to say “sadly we need to these days” but I’m having fun doing it (although I have nothing to sell… yet – hopefully a writing workbook and various items of fiction later this year) and it does get you directly to your audience, and hopefully have some of them come back to ‘talk’ to you. 🙂 Have you won or been shortlisted in any competitions and do you think they help with a writer’s success? Michele: None, more’s the pity! I would think they help. I always try to read books nominated for the Pulitzer or shortlisted for the Booker prize. Morgen: Although some people disagree with the books chosen for such prizes, having something like that would boost a CV (I think it certainly helps mine). Do you have an agent? Do you think they’re vital to an author’s success? Michele: No. Or maybe I should say, “Not yet”. I submitted my mystery to about 40 agents and finally began submitting it directly to small presses. Mainly Murder Press liked it and is taking a chance on me! Morgen: Yay! Well done. 🙂 You mentioned eBooks earlier, what was your experience of that process? Michele: “SNAP: The World Unfolds” is currently available on Amazon, B&N and Smashwords. “Edited for Death” will be available in November. I’m still mulling over the process. I thought they uploaded easily, I checked the first few chapters for formatting errors and now have had a few people tell me there are still some formatting problems. Morgen: Oh dear. Teething troubles I guess. Michele: I’m going to have to decide if I want to unpublish them for up to four days; so far people have said not to bother, they’re less than a lot of errata in print books. Morgen: I think people do forgive formatting, it’s grammar and typos that switch readers off. Do you read eBooks? Michele: Yes, I do. I have a Nook and like it very much. I used to have to lug pounds of books around with me; now I just pack it (and the charging cord!). I still mostly read print books though, probably force of habit. Morgen: 🙂 I’m the same. I read paperbacks at home because they’re there but my eReader comes with me on trips (which is rarely). What was your first acceptance and is being accepted still a thrill? Michele: “Edited for Death” was my first acceptance. I was dealing with email when up popped one from the small publisher I’d sent it off to. I didn’t open it right away, thought it was just another “No.” I was stunned when I opened it and saw a contract attached! I called my daughter and she thought I was kidding, then I wandered around the house, ended up in the laundry and screamed out loud, “I’m going to have a book published!” I’m sure I’ll get another thrill when it actually comes out. Morgen: Absolutely. You said “just another ‘no’” have you had any many rejections? If so, how do you deal with them? Michele: Oh, tons. Mostly from agents, but some from small presses. It’s very hard, because it’s so personal. This is something you’ve put a great deal of time, effort and ego into and the first reaction to a “No” is that somehow they’re telling you you’re a bad person. It’s difficult to separate “We don’t like your book” from “We don’t like you.” As one friend said, “Just think that each No is one step closer to Yes.” I try to just cross them off the list and send out the next batch of letters, synopses, pages. Morgen: That’s it, just keep plugging away. It is hard not to take it personally but you have to remember that what won’t suit one person will suit another (you’ve proved that with ‘Edited for Death’). What are you working on at the moment / next? Michele: I have to stop all this Twitter / Facebook / marketing stuff and sit down to write. Michele: I’ve started both the next book in the “SNAP…” series, “SNAP: New Talent,” and the next in the mystery series, “Death in the Vineyard.” I’m shooting to finish the SNAP book by the end of this year for publication in later winter. “Death in a Vineyard” should be finished by spring (I’m thinking April). Morgen: Yay! Do you manage to write every day? Michele: No, I wish I could. So much time is taken up with marketing, social media stuff, plus I’m frantically looking for a day job. I was laid off more than two years ago and have run through my unemployment, so the wolf is at the door! Morgen: Oh dear. That’s happened to me twice (the ‘laying off’ bit) but I’ve been lucky and either gone temping or had something else lined up. I walk past a Job Centre to my job and can’t help feeling fortunate. What’s the most you’ve written in a day? Michele: On a good day, I write about 1,500 words. I’ve had a couple of uninterrupted days when I managed close to 2,500 words, but not often. Michele: I think everybody who writes, regardless of the type, gets blocked occasionally, but it’s harder for a fiction novelist who lives in his / her head. I do get blocked sometimes. I don’t know about a “cure” but if something’s not working for me, I do something else—the dishes, laundry, gardening, even reading—for a while. I also skip the scene(s) that have bogged me down and start writing sort of stream-of-consciousness stuff that may or may not get used. Morgen: I think that’s the best thing to do. Forget about it and it’ll be easier to fix when you do return. Do you plot your stories or do you just get an idea and run with it? Michele: About half and half, I suppose. I come up with a story idea then roll it around in my head for a while until I see if there’s enough substance to plot out an entire book. Morgen: And if there isn’t it becomes a short story? 🙂 Do you have a method for creating your characters, their names and what do you think makes them believable? Michele: I guess I’m plot-driven. Something happens and then my main characters are pulled in, or react to the event. I create people who would naturally be involved in the event; in the mysteries it’s police, neighbors, suspects, the reporters who cover events. In the “SNAP…” books it’s a little different. The plots revolve around threats, so characters evolve to either threaten or to save. Names, well… I use the phonebook a lot for names in the mysteries. In “SNAP…” I’m using as many Austro-Hungarian names as I can that I’ve heard while visiting Hungary. Morgen: And presumably the internet is great for foreign names. Who is your first reader – who do you first show your work to? Michele: My daughter! She’s an avid reader, even worse than I am. And she’s danged critical, too! Morgen: Ooh, does she write? If so, feel free to invite her to have an interview with me. 🙂 Do you do a lot of editing or do you find that as time goes on your writing is more fully-formed? Morgen: And hopefully it’s yes, yes, yes. 🙂 What is your creative process like? What happens before sitting down to write? Michele: Hummmm, I’m not sure. I’m always living with the novels, so when I sit down, I usually start writing what I’ve been thinking or seeing them do. I’ve found that you can do chores easier if you’re engage somewhere else in your head! Probably writing, or at least making up stories, has been my way of escaping the real-ies. Morgen: Escaping’s great. Do you write on paper or do you prefer a computer? Michele: Years ago, I wrote things out longhand because I didn’t own a typewriter. That was a slow and laborious process and many times I couldn’t read my own handwriting. Computers are a God-send, but I still don’t type fast enough to keep up with my thoughts, so I make a lot of mistakes, typos. Clean copy and I are not friends! Morgen: 🙂 I’m lucky. I’ve been a secretary since I left school so my typing speed’s got quicker (and my handwriting speed slower). What sort of music do you listen to when you write? Michele: I don’t. When I’m writing, I’m telling and retelling the story and I always visualize. I love music, I listen mostly to classical, but when I listen, I don’t want it for background, I want to listen. Morgen: I’ve been surprised how many interviewees say the same. I have classical but I must admit that I do concentrate better with silence (but, apart from the dog, it keeps me company). :)What point of view do you find most to your liking: first person or third person? Have you ever tried second person? Michele: I wrote the first draft of “Edited…” in third person but found I was dumping way too much “chat” in. It’s now in first person, present tense with historical flashbacks in third (World War II plays an important part). “SNAP…” is in first person because I wanted Maxie’s reactions to the vampires to be personal. First has some drawbacks, among them POV. I’ve never tried second person; it might be interesting. Morgen: I love it and… blatant plug alert: will be posting some at my new blog https://morgenbailey.wordpress.com/sentence-starts page. 🙂 Do you use prologues / epilogues? What do you think of the use of them? Michele: I’ve used a prologue in “SNAP…” to help set up tension. I like them for some things, but I think they’re overused in the thriller genre. The prologue from the POV of the crazy killer or angry killer who’s out to get rid of women because they remind him of his mother… I want to figure out for myself who the murderer is. Morgen: (note to self: when next writing crime avoid ‘the crazy killer or angry killer who’s out to get rid of women because they remind him of his mother’) 🙂 Do you have pieces of work that you think will never see light of day? Michele: Oh yes. Poems, some short stories, the first 50 of so pages of a coming-of-age novel, lots and lots of two or three page notes that may never get worked into any story. Morgen: Or may. 🙂 What’s your favourite / least favourite aspect of your writing life? Michele: Least favourite: Finding the blocks of time to write. I don’t outline chapters—although I always have a plot outline in my head, and occasionally on paper—so when I begin to write, I need to spend some time to get into the story to date. And once I’m there, it’s difficult to get pulled away and start again. I’d love to have the time, money and discipline to set aside 4-5 hours every day for writing. Favourite: Watching characters develop and evolve, reading parts that are well-written and I love. I have a passion for puns, and when I can work some in, it delights me! Morgen: 🙂 I know how the cramming for time goes. I’m pretty sure every writer (even full-time ones) would say the same (as does my non-writing garden-loving mother). If anything, what has been your biggest surprise about writing? Michele: How the characters grab hold of themselves and take off in directions I hadn’t planned. It’s strange sensation to be writing along and have someone go off on a tangent, even though it makes a better story. It’s a little like heading out on a trip. You know the destination, but you may go down side roads or detours or the trip might take longer than you expected, but the journey itself is wonderful. Morgen: It’s great, isn’t it. That’s probably my favourite aspect. What advice would you give aspiring writers? Michele: Write, write, write. Read, read, read. That’s the advice I used to give to new reporters. One question I always asked during their job interview was “What are you currently reading?” And have an idea where you want to go with whatever you’re writing. I had to teach one young reporter to write her lead paragraph BEFORE she went out on the story interview. She asked what to do if it’s different than she expected and I told her it was easier to change it than not even know where you wanted it to go. Michele: Anything! That’s not entirely true, almost anything that’s well-written. I read a lot of fiction; bestsellers, literary fiction, mysteries; some biographies (anything by Antonia Fraser or David McCullough); history, particularly medieval. I loved “Salt”, by Mark Kurlansky and “Assembling California” by John McPhee, books that explain how the world is woven together. Morgen: I went to a writers’ conference recently (the great yearly Winchester) and on the dinner table each evening was a Writing magazine (which I’d sadly already got as I subscribe to it) and a book. On the Friday night was Antonia Fraser’s autobiography of her life with husband Harold Pinter ‘Must you go?’ I’ve not read any of her fiction. Having said that, I’ve not read ‘Must you go?’ yet either. 🙂 Are there any writing-related websites and / or books that you find useful and would recommend? Michele: I’m still sifting my way through things, but Google is my best pal. Morgen: I’m pretty pally with Google too. 🙂 In which country are you based and do you find this a help or hindrance with letting people know about your work? Michele: I live in the U.S. (California) so it should be easy to let people know about me. It’s turned out to be a lot more difficult! Morgen: Oh dear… persevere. Things do just take time because there are so many of us doing the same thing. But it’ll be worth it. You just need 10 people to tell 10 people, and so on. Are you on any forums or networking sites? If so, how invaluable do you find them? Michele: I belong to Sisters in Crime and the subgroup Guppies. Morgen: Ah yes I’ve heard of them. I’m going to have to check them out because I’ve been told (by an agent!) that I should write crime. I read it so it makes sense. Where can we find out about you and your work? Michele: My website, http://www.micheledrier.com is a good place to start. My latest book’s Amazon site, http://www.amazon.com/dp/B0059K50D8 is a place to go to read a short synopsis and the five star reviews I’ve gotten. You can also Google me! Morgen: There aren’t many Morgen Baileys either (more Morgan with an ‘a’; I do wonder whether I lose some ‘traffic’ because of my spelling). What do you think the future holds for a writer? Michele: My mother said I’d be happiest starving in a garret for the love of art (and / or a man) and I think this is a future for many if not most of us. It’s a heady feeling knowing that you can write a book and get it published in an ebook format. But that also means there are millions of books out there, some good, some not, competing for buyers and readers. It’s ironic that you can get published easily today, but you still may not get read and probably will never make a living from it. Morgen: Given the art or man, the art would win… but that’s probably because I’m single. No, thinking about it, the writing would win every time. 🙂 Is there anything else you’d like to mention? Michele: I always wanted to be a race-car driver! Morgen: Oh, wow! Bit difficult to steer with pen / paper in your hand though. 🙂 Thank you Michele. Michele Drier was born in Santa Cruz, California to a family that migrated west to San Francisco in 1849. Unfortunately, they never found gold, nor did they buy (and hang onto) any California land. She’s lived in San Francisco, Southern California and the North Coast. She’s spent time as a reporter and editor for daily papers in California, and was the city, metro and executive editor for daily newspapers. For 3 years, she served as a judge for the California Newspaper Publisher’s Association Better Newspapers competition and won two awards for directing Investigative / Enterprise stories. UPDATE JUNE 2012: Edited for Death is now out in trade paperback and ebook format, both available at Amazon. The vampire romances, The Kandesky Vampire Chronicles, are moving ahead with SNAP: New Talent, Book Two of the Chronicles, now available on Amazon and Book Three, Plague: A Love Story, debuting after June 15. A fourth, Danube: A Tale of Murder is coming in August and the second mystery, now renamed Labeled for Death, pushed back to winter. They get their own back… interviews of me. Thanks Morgen, you’ve made me sound capable and sane! I’ve enjoyed the interview. I enjoyed reading the interview. It struck me how many of us write in various genres. Michele, may you have many sales! Michele, THanks for sharing your writing and promotional journey with us. It’s difficult to find the time to write and edit, when you’re promoting in person and on-line. It’s even worse if you’re baking dead body cookies to take to events. But trust me, it does work, so hang in there. Maybe that should be our new mantra, Marilyn: “May the sales be with you! Thanks! I find I kind of like promoting, too. But it’s hard to find time to do both promote and write. Thanks for the interview! You DO sound capable and sane, Michele! It does seem that crime sells well in novels, particularly in mystery series. However, this is not necessarily the case for short story fiction. Congratulations on getting to ‘yes’ and on your debut!